Dust devil tracks in the Diacria region. 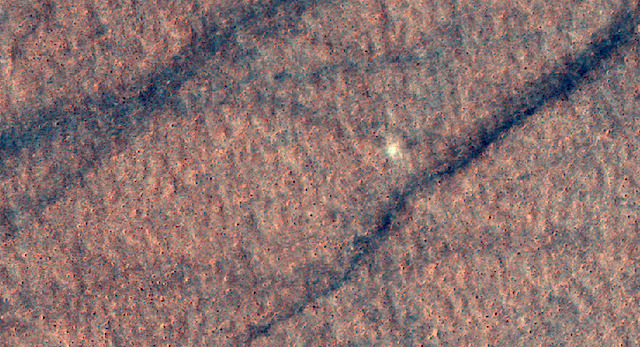 Our eye might deceive us, but that bright spot in the enhanced color image looks suspiciously like a dust devil in action. Hmmm…. This entry was posted in Reports and tagged Beautiful Mars, Diacria, dust devil tracks, dust devils, High Resolution Imaging Science Experiment, HiRISE, Mars Reconnaissance Orbiter, MRO, NASA, University of Arizona. Bookmark the permalink.